swale1984 wrote: Yep! It was NOOR. I was looking at the list of winners, and thought it was interesting that Kayak II set the record of 2:01:40 in 1939, Seabiscuit lowered it by 1/5 the following year, and it stood until the last winner owned by Charles Howard broke it 10 years later. Swale1984, and thirty years after it was Spectacular Bid who broke Noor's record for the distance of a mile and one quarter on dirt at Santa Anita, by winning the 1980 Strub Stakes, under Bill Shoemaker. A record still stands today. This horse brought Bill Shoemaker for one of his victories in the Big Cap, and this was the only time that Announcer Trevor Denman provided the race call for one of Shoemaker's wins in the Big Cap. What is the name of that horse? Lord At War in 1985. Last SA Handicap win for BS. A young Larry Collmus called that race from his sofa. I wasn't even born when Trevor Denman called Bill Shoemaker's victory of the 1985 Santa Anita Handicap on Lord At War. But it was Trevor Denman who called the 1985 Santa Anita Handicap, few years before I was even born. Congratulations, Blue Jeans, Lord At War is the correct answer to my trivia question. OK. Here it goes. This horse ( gelding) was purchased by a man with the top derby prospect of his time to be that colts workmate. won! At the end that gelding won 49 or 50 races out of 100 starts. Raven wrote: OK. Here it goes. This horse ( gelding) was purchased by a man with the top derby prospect of his time to be that colts workmate. Thanks to you for your question. A most interesting read for all racehorse fans .... Exterminator was some horse!!! ETA: Willie Knapp [jockey] became an instant fan of the tall chestnut gelding. Many years later he said of the champion: "When he was at his best, Exterminator could have beaten Man o' War or Citation or Kelso or any other horse that ever lived on any track doing anything." Here is my trivia question. This horse became the only horse in history to win the Hong Kong Triple Crown for Three Year Olds And Up by winning the Steward's Cup, Hong Kong Gold Cup, and Hong Kong Champions & Chater Cup. 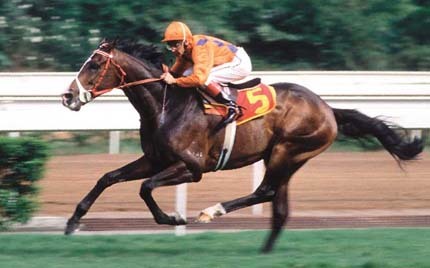 He was Hong Kong Horse Of The Year three times, during the Hong Kong Racing Meet of 1990-1991, 1991-1992, and 1993-1994. However, this horse finished eleventh to a horse that was ridden by Cash Asmussen in the Arlington Million, what is the name of that horse? Congratulations Swale1984, River Verdon is the correct answer to my trivia question. In what year did the winner of the Travers beat, for the first time ever, that year's Kentucky Derby, Preakness and Belmont winner and name all four horses involved (winner of the Travers and winner of each TC race) ... and how they placed in the Travers. It was 1982, and Runaway Groom won the Travers. I know Gato del Sol was the Derby winner and Conquistador Cielo was the Belmont winner but I can't for the life of me remember the Preakness winner! I also can't remember how they finished!!! Should I not have answered because I didn't have the entire answer? You answered most of the question correctly, so we'll accept it.